Of course, we all had our jobs to do, I was busy with boats and Nacho mountain guiding. So we realized we needed another enthusiast with technical knowledge and background. It was then a punk, Jordi Tosas, stepped in to do the fine tuning. The project had attained a significant scale and we had expectations to meet. Jordi undoubtedly transmitted the optimism and drive we needed to the team and filled us with energy and expertise after we had already devoted some 300 hours to the project. With Jordi on board, we added 20 mm extra blade attack and built ​​a tailor made grip for Kilian’s hand with a big glove. There were only a few weeks left for the journey and I called Jordi to tell him he had no choice but to try it before Kilian did. ‘Done!’ said Jordi. ‘I’m back in Barcelona. ​​Send it to a petrol station there is on a nearby road and, on my way home, I’ll get it, I’ll try it and then we’ll build the last version with all the improvements’. I did what he told me but, to be honest, the thought of having to trust a courier and leaving the axe at a petrol station in the middle of the Pyrenees… after more than 400 hours of work, such an investment and above all, such excitement… scared me more than climbing the Cassin barefoot! Jordi called me the next day and told me it was awesome but we had to change the grip on the head, the last sprint before flying to Anchorage. Why? Because much of the route on Mount Mckinley would entail holding the axe’s head and it was too wide, and the grip had too little contact with gloves on. This was a hurdle! The mould needed modifying and the part where force was absorbed in the zone by the blade, restructuring. Let’s go for it again! There was not a moment to lose. That was our own particular Summits. 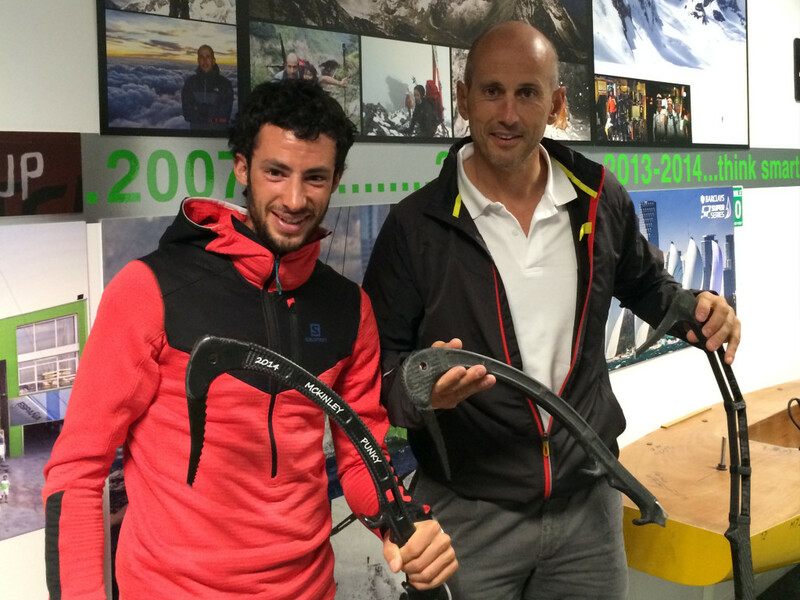 Finally, a few hours after Kilian won in Zegama, I met him and gave him the latest axe, just a few hours before he was due to fly to Anchorage. And this is the end result! A great, personalized piece, which is more resistant, lightweight and reliable than the previous two. For your information, the closest thing you can find on the market weighs twice as much. Agustín Zulueta, Jordi Corominas, Nacho Morales, Kilian Jornet, Guille. Poncinibio, Gabriel Mariani and Jordi Tosas. Number of items made: 4. Weight: 263gr, 316gr, 314gr and 292 grams, respectively. Hours invested in the project: over 500 hours over 7 months. Production hours of the first piece = 96. Ice axe used in the record: The first prototype, the lightest!